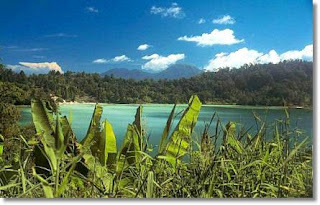 About 36 km southwest of Manado is Lake Tondano, 600 m above sea level. The drive to Tondano passes through charming villages and sprawling clove plantations. Situated right on the edge of the lake is the Remboken Tourist site, an ideal place for after skiing, fishing, and natural boating. Bungalows, a natural hot water swimming pool and restaurants are available.